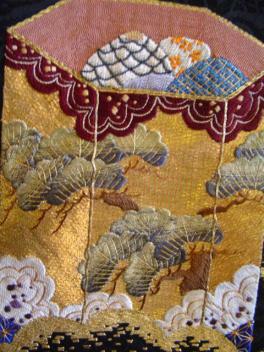 The links to the left will guide you to the pages for garments. Measurements, should you require them, can be had for the asking via email. Purchasing is just as easy, and is detailed further in the page "Purchasing And Layaway Policies." You can also email me for that information. 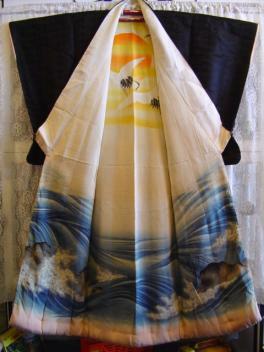 My vintage-to-antique silk Japanese garments are all in extremely good condition, with any exceptions noted in the description for each garment. 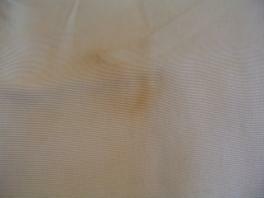 I never present garments with significant problems, except for the cotton working garments, which sell better when they are thoroughly worn. Whether for men or for women, my garments will take you straight from the grocery store to the opera. 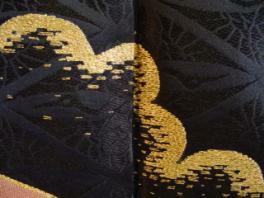 There are no issues with fit on the haori, as we wear this garment open, not closed or belted. 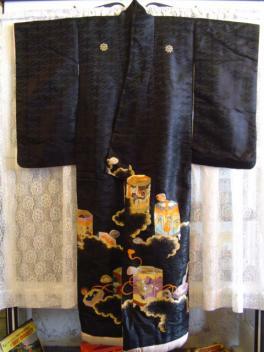 The juban is a mid-length garment that is designed for wearing as an extra layer beneath the kimono during cold weather; an especially nice garment for those of us who are not very tall and would like a long garment to wear either at home or going out on the town. 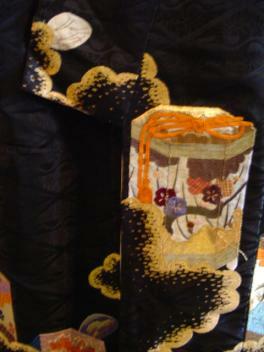 The patterns and colors make them a very functional longer garment for special occasions or for everyday wear. 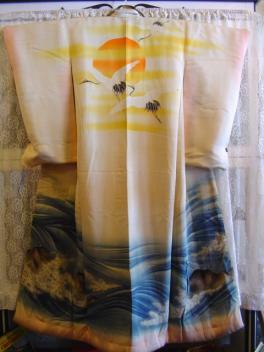 The kimono, with a few exceptions, is best for the taller individual unless you wish to wear it in the traditional way, or at home as a robe for entertaining or just a house robe. The prices compete easily with new synthetic mass produced garments that are available in the department store of your choice, and I promise you that the department store garments are not going to survive the comparison. Here at Blue Moon, you can have a one of a kind vintage garment for the price of mass produced; in many cases my garments are LESS expensive than the department store dregs. What is there to think about? One of a kind vs 800,000 of a kind. YOU decide what you want to be seen in; I know I have! The stunning garment below is sold, but the pictures remain in tribute to one of the most amazing examples of this wearable art. 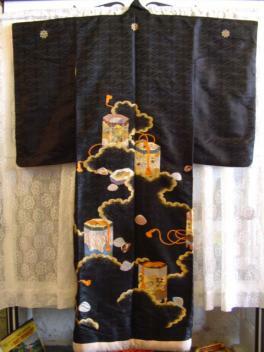 Black is rare; a black crested Uchikake is even more rare! 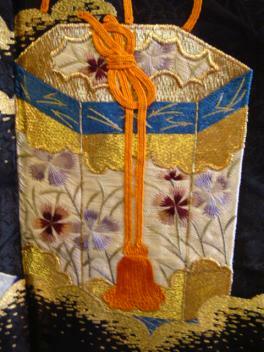 The reverse of this garment will be shown in-depth futher down the page. 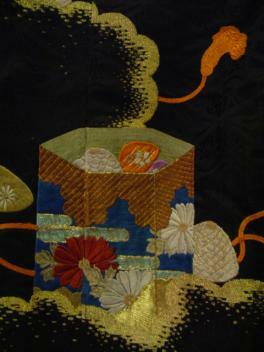 Japanese gifts abound, here, along with wrapping cords and clouds. 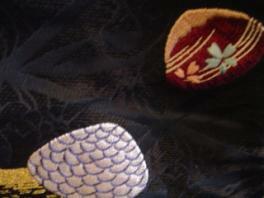 These close-ups show how carefully dimensional the embroidered items are. 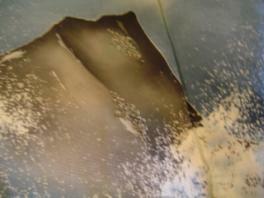 What would be on top in life is on top in these depictions. 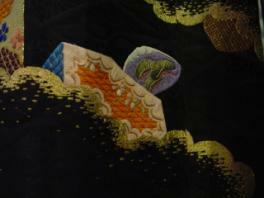 Even the tiniest details are painstakingly rendered here. 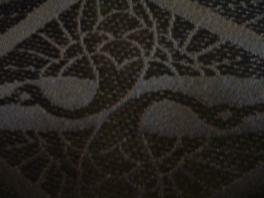 The right picture above shows the perfect matching at the back seam. 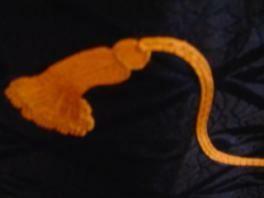 Picture left is of the embroidered crest. 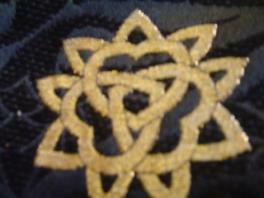 Note the three joined hearts; also note how the embroidery is carefully done so that you can see exactly how the hearts are linked. 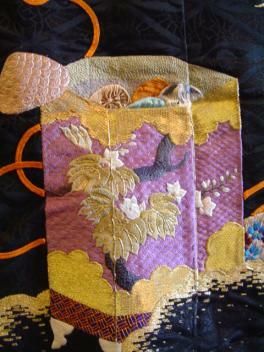 Picture right shows the jacquard pattern of double cranes that is the outer shell silk of this garment. Each of the gifts is different from each of the others. 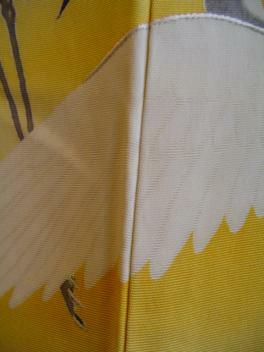 Picture left shows another example of the perfect joining of the pattern along a vertical seam. 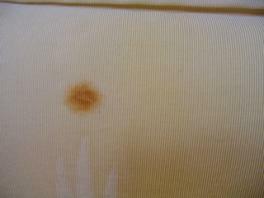 This is the same garment; reversed. 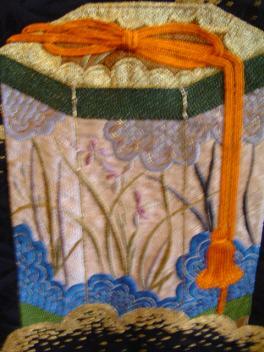 It is the ONLY Uchikake I have ever seen that could be completely reversed and still show as a complete garment, fully decorated. 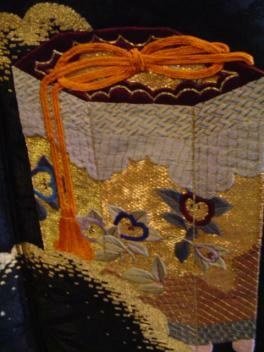 The inside is Yuzen and embroidery. 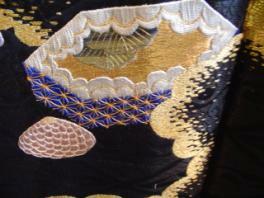 Picture left is the inside of the garment along the front opening. Note once again, perfection of linear pattern here. 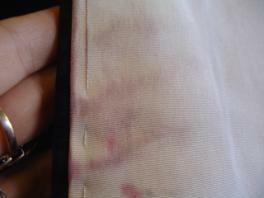 Picture right shows the pink dip dyeing of the outer edge of the sleeve. 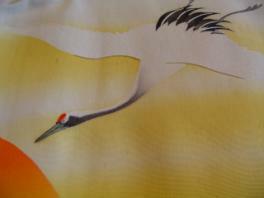 Picture left shows a small spot of noruki on the crane's leg. 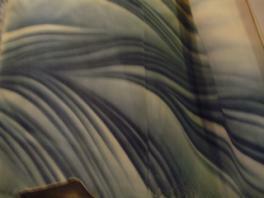 This is life size. 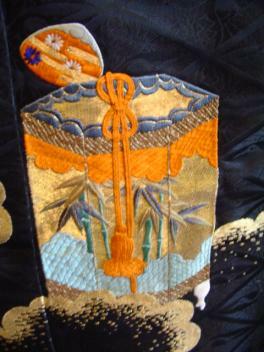 Picture right shows another example of perfect pattern match, and also shows the silver embroidery detailing the edge of the crane's wing. 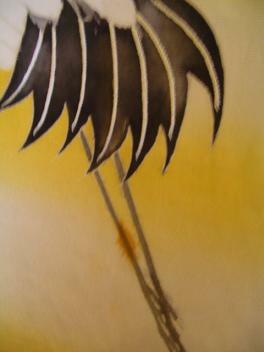 Cranes at sunrise, beautifully painted. 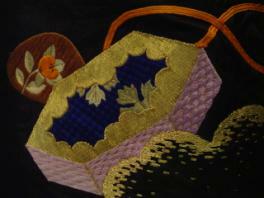 Picture right shows tiny noruki in the crane's wing. 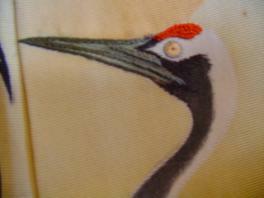 Close up of crane's head shows the embroidered detail in red, and also the grey detailing on his beak. 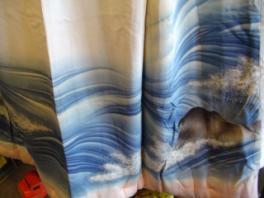 A slightly closer look at the waves and rocks painted in this garment. 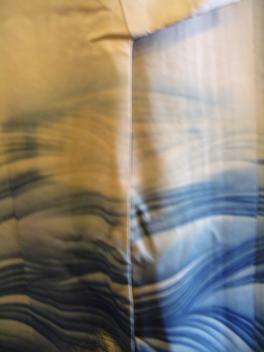 Both pictures contain a vertical seam in the fabric. 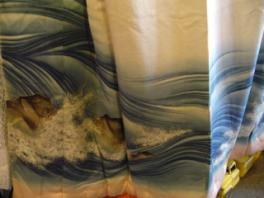 Note how well those seams are hidden. 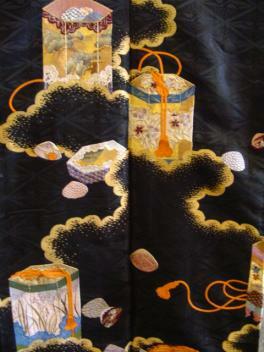 The grey parts of the sea foam on the rocks are done in Sakura embroidery. 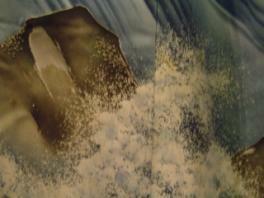 The picture left shows water crashing onto the rocks in such a realistic way that you almost feel the spray! 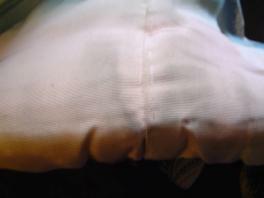 The picture left shows the heavy padding at the bottom of the hem. 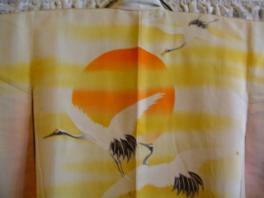 Picture left is the noruki to the left of the lower crane that you see in picture above, 'Cranes at sunrise.' 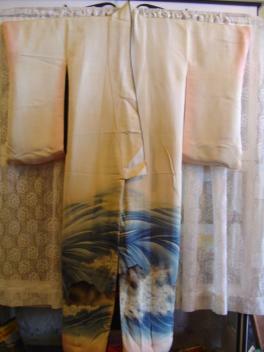 Picture left shows a very pale area of noruki on the inside back of the left sleeve. 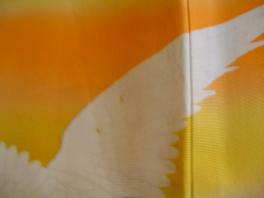 Picture left shows some color transfer to the inside of the collar strip on the wearer's left. 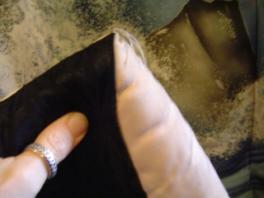 Picture right shows dust marks on the edge of the padded hem inside.